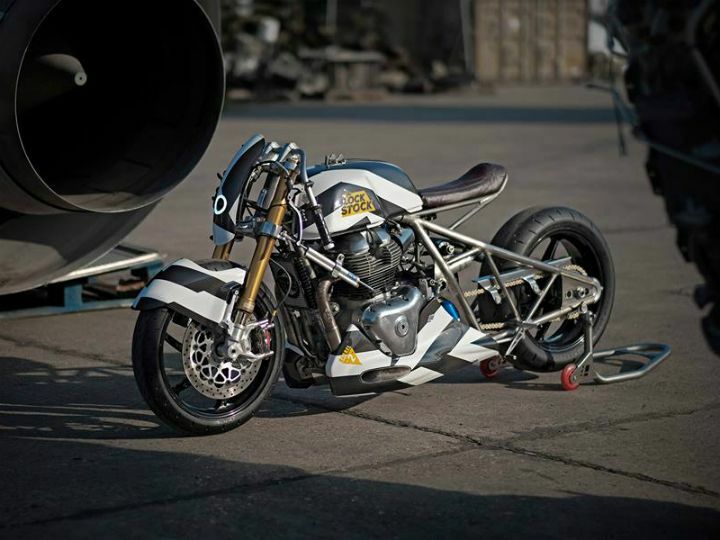 Royal Enfield unveiled a high-performance drag bike called the LockStock at an event held by The Bike Shed Motorcycle Club in London on 25 May, 2018. Based on the 650 twins, the LockStock has traded most of its components for high-performance parts. In fact, the only thing that remains from the 650 twins are the engine and fuel tank. 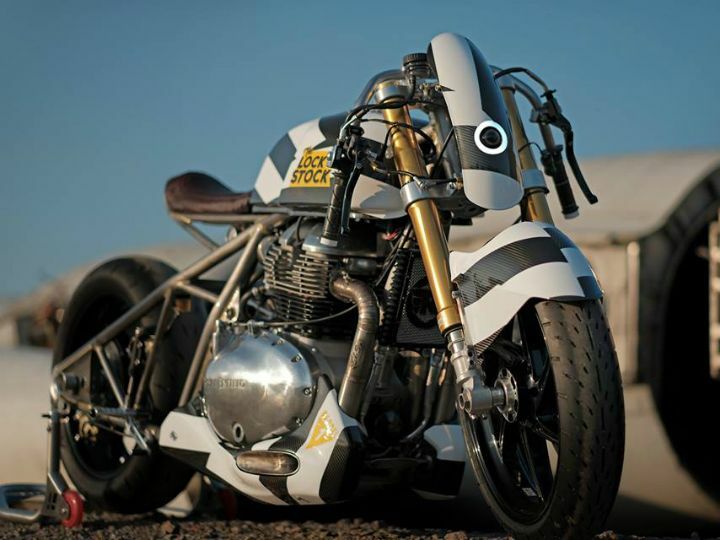 From the pictures seen online, we know the bike features minimal bodywork. The Suzuki Hayabusa-inspired front fender helps in minimising the drag coefficient. The front fairing houses a projector headlamp surrounded by an LED halo, while the handlebars have been designed to be extremely low slung and near vertical, which may have been inspired from board track motorcycles. The café racer-styled tank gets a quick release fuel cap used in race bikes. A single, slightly elongated seat cushions your backside, while the incline towards the end prevents the rider from sliding off. It also sports an underbelly exhaust integrated within the sculpted belly pan. While there are no numbers available for the LockStock, we do have the spec-sheet for the donor motor – the twin-cylinder engine from Continental GT 650. In stock form, the 648cc, fuel-injected, parallel-twin engine produces a maximum of 47.65PS at 7100rpm and a peak torque of 52Nm at 4000rpm, mated to a 6-speed gearbox. Additionally, the dragster carries a NOS canister for that extra boost needed in the straights. If we were to speculate, we’d say the LockStock pumps out twice the amount of power the stock bike produces. The LockStock is based on the Continental GT’s double-cradle frame. However, it’s been modified for an extended wheelbase to aid stability and prevent the bike from wheeling off the start-line. A steering damper, presumably from Ohlins, which extends from the chassis to the front forks (the first we’ve ever seen) should help improve the rider’s confidence. 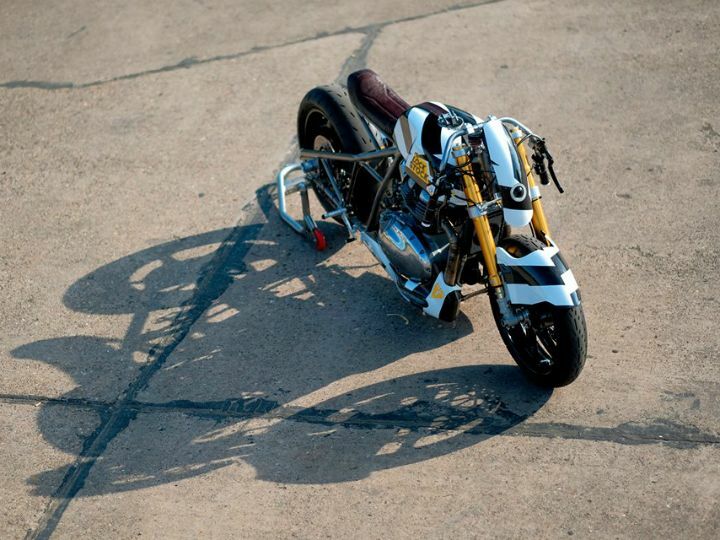 The hard-tail motorcycle gets an Ohlins suspension upfront, which has been slammed for the least amount of suspension travel and to keep the center of gravity as low as possible. Braking duties are handled by a single disc and a radially mounted Brembo four-piston caliper at the front, while the rear gets a single disc and a two-piston Brembo caliper. Not much has been revealed about the bike apart from the pictures that were released online. So, watch this space for more details.